We have a large stock of second hand trailers available for immediate purchase, for further details on our entire range please call us on 01922 452456. This new Eventa L gold with side storage locker and additional headlocker features heater/ water heater, shower, extra water tank and outside tap. 12v and 240v power hook upssockets. 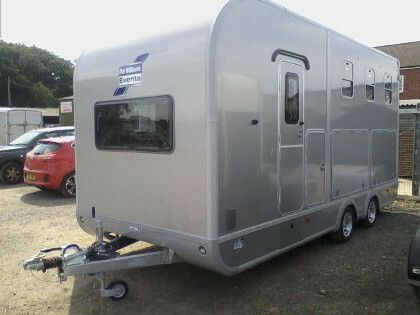 We now have this brand new 'Business in Box' trailer with side door in stock. This Blue HB511 horsebox with door mounted tack box and sliding windows, comes fully serviced and fitted with a spare wheel. 2017. This Black HB511 horsebox with sliding windows comes fully serviced and fitted with a spare wheel. 2009. This Blue HB506 horsebox with sliding windows comes fitted with a spare wheel and is fully serviced. 2017. 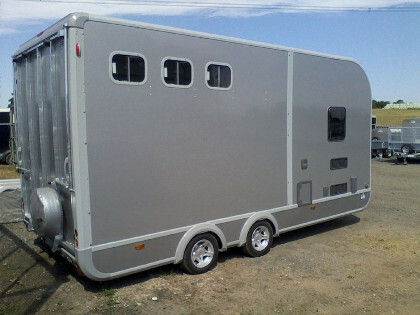 This Silver HB506 horsebox comes fitted with a spare wheel and is fully serviced. 2009. This Apono Classic HB505 horsebox with sliding windows and allow wheels comes fully serviced. 2006. This Black HB403 horsebox comes with fitted tack box on the door is supplied fully serviced. 2009. This 14' tri-axel TA510 trailer with easyload decks and (2 sheep, 1 cow) partition comes fully serviced, and fitted with spare wheel. 2017. This 14' tri-axel TA510 trailer with easyload decks and partitions comes fully serviced, and fitted with spare wheel. 2014. This 14' tri-axel TA510 trailer with easyload decks and (2 sheep, 1 cow) partition comes fully serviced, and fitted with spare wheel. 2012. This 12' TA510 trailer with easyload decks and partitions comes fully serviced, and fitted with spare wheel. 2014. This 14’ tri-axel DP120 comes with easyload decks and partitions. Fully Serviced, and fitted with spare wheel. 2014. This 12’ tri-axel DP120 comes with a partition. Fully Serviced, and fitted with spare wheel. 2012. This 12' DP120 with easyload decks and partitions is not Serviced. 2008. This Ifor Williams Container is 12' long, 6'6 wide, and 6' high. It features easy load decks and partition. This container is 12' long and 6'6 wide and has gates and partition. This GX126 trailer with ramp comes fully serviced. 2015. This 3.5 ton gross GX105 trailer comes fully serviced. 2015. This GX105 trailer comes with 4' ramp. Fitted with spare wheel and fully serviced. 2009. This TT105 tipper trailer with mesh sides is fully serviced and supplied with spare wheel. 2008.